Mr. Tonegawa: Middle Management Blues, or just, Tonegawa for short, was a show I watched from the Summer 2018 season more out of obligation than because I genuinely wanted to. My relationship with the original series that this is a spin-off of, Kaiji, is a somewhat rocky one. You can view my thoughts on both season 1 and season 2 of that series to get the full picture. Still, this promised me comedy and Tonegawa is a character I liked so there was some hope for this series. Did it manage some laughs and did I like it? Let’s find out! 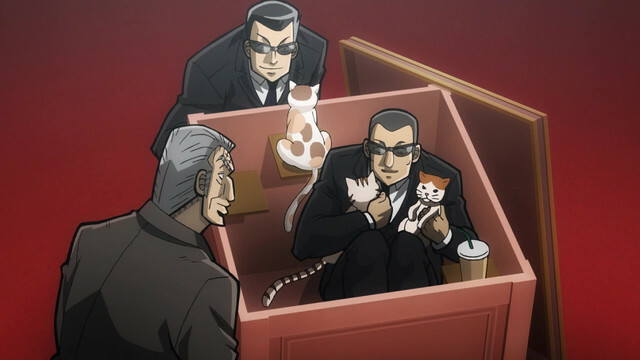 For those of you who may not be familiar, Tonegawa follows one of the antagonists from the original Kaiji series. He’s the number two man for a (sort of) evil loan-type organization know as the Teiai Corporation. His job is to keep the crazy president of the company happy, but it isn’t easy since he is into seeing the darkest parts of humanity in increasingly sick and twisted ways. Don’t let that fool you though, this is a comedy for the most part. While Tonegawa certainly straddles the line with some rather dark comedy, especially if you’ve seen Kaiji’s first season, it is overall a fairly tame affair. Really, the show is at its best in these moments but they are far-and-few-between. When an episode landed, say episode 3 for example, it really landed. However, most episodes were only minorly funny or simply wholly uninteresting. Still, there is a charm here that kept me watching in spite of all that. While it felt like a slog across its 24 episodes at times, there would be streaks of good episodes or that one thing that made watching worth it each week. If you haven’t seen the show, what do you think is going on here? Part of this is enjoying all the nods to Kaiji. Even though I wasn’t a big fan, I do really enjoy referential works that I get. There are a lot! Some of them make scenarios in the original very absurd, to the point where you’d never be able to take them seriously, and others were just respectful nods. At the halfway point I was having a decent time. Then the show decided to pivot and it really suffered for that. It decided to incorporate some season two stuff and follow a different character who is, for one, less interesting, and two, somebody you shouldn’t like at all if you’ve seen Kaiji’s second season. No longer a comedy, instead it became a foodie’s dream show. It wasn’t like these episodes were terrible but this show was supposed to be about Tonegawa, right? I don’t want to follow Ootsuki. They do bring it all together at one point, but it really wasn’t enough to justify the lengthy diversion. By the homestretch, it does focus again solely on Tonegawa but these were among the least interesting episodes. It even had the audacity to throw itself a party for the last episode. You know what though? I was fine with it. Part of me was relieved that the show was finally over but the other part of me thought that Tonegawa had earned its ending. The show had fun, wanted you to have fun watching, and at the end of the day, that’s all you can really ask for. Some quick thoughts that didn’t make it into the main review here. The various, “Zawa, zawa’s” and iterations thereof, were all done by different actors each episode. I liked that. This is by far one of the biggest things that is unique to Kaiji and having this much dedication and attention put to making this really standout even more in this series was a very good touch. Furthermore, the opening changed quite often to reflect things that had occurred from episode-to-episode. While you probably won’t catch them at first, by the end of the show it is like night and day with the amount of little things that have changed with time. It’s an underutilized treat when animators go that extra mile to really make a show stick out just that much more. I was impressed. While I wouldn’t say this show was all that great, I did enjoy it. Somehow, it was better for me, even if a lot of it just wasn’t all that interesting. 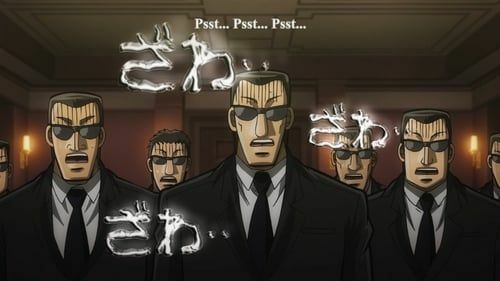 Tonegawa is something that die-hard Kaiji fans NEED to watch, and if you’ve never seen Kaiji, it may spark some interest. However, it really is something made for fans and I can respect that. What are your thoughts on Tonegawa and were you a fan of Kaiji? Let me know in the comments below. If you’d like to support the work I do here please consider hitting my donation button and tossing a few bucks my way. Lastly, I appreciate you taking the time out of your busy day to read this and I hope to see you back here again soon! ‹ PreviousThe wordpress anime awards 2018: Ladies and Gentlemen, the results are in! Next ›Anime ABC’s – Q Voting Round? I’m a huge fan of Kaiji. A friend told me to watch this, but somehow I forgot about it until reading your post. I’ll have to check it out now. Tonegawa was one of my favorite characters in the show. I would never have guessed that they’d throw Ootsuki in, though. I guess I’ll have to see where they take it. I’d actually never heard of Kaiji until now, but this anime looks pretty comedic. Kaiji also looks interesting though! Thanks for the review, I love discovering new anime like this. Oh, nice! It’s always fun to discover something new 🙂 If you decide to watch I’d definitely do S1 of Kaiji first then move either to Tonegawa or S2. You’ll probably end up binging though, so fair warning! I knew you’d love it for sure! 🙂 Who knows, it certainly is possible.